Typhoon-sized riffs and adventurous song structures define Paradise Gallows, the latest release by Virginia metal outfit Inter Arma. Few album names in recent years have been as apt as The Cavern, the single-track, 45-minute long EP by the Virginia metal outfit Inter Arma. One can call what Inter Arma does a kind of sonic spelunking, an exploration of the dark and uncertain, a descent into inky blacks. On that EP and its predecessor, the band's much-lauded Relapse debut Sky Burial, Inter Arma incorporated numerous styles of metal into a coherent and compelling whole. The Cavern is an especially dizzying thing, the kind of piece that makes one feel as if she has experienced an entire epic journey by the time the track comes to a close. The word "progressive" has not unreasonably been thrown around in discussions of the band, but it's important to distinguish here between "progressive" and "prog", because Inter Arma never succumbs to the excesses of the latter. Never does Inter Arma capitulate to the grandiose excesses that Between the Buried and Me did on 2012's overstuffed The Parallax II: Future Sequence. Inter Arma's brand of sonic exploration has never been about cribbing influences for flashiness' sake. The Cavern and Sky Burial are simultaneously natural and progressive; movements within ten-to-40 minute tracks feel unhurried and measured. When these guys explore, they go deep, but somehow, even in the lowest of depths, the songs never get lost. Paradise Gallows, Inter Arma's second full-length LP for Relapse, is a similarly free-spirited adventure into nearly all corners of the metal world. The record's gorgeous sleeve art (designed by Relapse's in-house artist Orion Landau) shows a ship sinking into turbulent waters, with a lush pastel sky overhead. Just as it is with The Cavern, whose title signals the journey the listener must take, the cover of Paradise Gallows foreshadows the stormy climate on the horizon. But the multicolored sky on the cover also suggests that Inter Arma's latest voyage is not going to be consumed entirely by the harsh push-and-pull of typhoon riffs and and gut-punching drums -- though there is plenty of each on Paradise Gallows. These seas are not for those hoping for fair waters, but that doesn't mean there won't be beauty to be found. It is remarkable that Paradise Gallows is as musically diverse as it is, given what Inter Arma has already achieved on Sky Burial and The Cavern. One of the biggest challenges a progressive band faces is in avoiding the problem of duplication. When you've covered so much ground, how can you make sure you don't tread the same paths again? Echoes of Inter Arma's previous records can be heard on Paradise Gallows, particularly when the riffs hit their highest peaks ("Primordial Wound", the title track), but the band is doing anything but repeating themselves. On mercilessly heavy tracks like the 11-minute stunner "Violent Constellations", which features some stunning drum work from T.J. Childers, Inter Arma pushes itself into even more daring sonic landscapes. Heavy as Paradise Gallows is, there's plenty of light to counterbalance the darkness. The melodic guitar on album overture "Nomini", which is later reprised on the transitional instrumental "Potomac", has a warm, classic rock feel to it that's accented with some distortion fuzz. The effect is something like David Gilmour playing guitar using the tones of Baroness' Yellow & Green. Amidst the furies within "Violent Constellations", guitar interplay akin to post-rock groups such as Russian Circles and Intronaut breaks out, which makes the song's thunderous conclusion all the more crushing. Reflective closing number "Where the Earth Meets the Sky" brings Paradise Gallows's exhausting 71 minutes to a somber end, also evoking the flavor of dust-flecked outlaw country. The prospect of a 71-minute album may prove daunting to some, and not unreasonably so: Paradise Gallows is a challenging listen if taken all at once, which is the proper way to experience it. 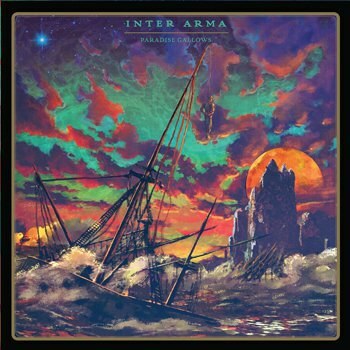 Because of the natural flow between the mostly long compositions on the record is so important, it's curious that Inter Arma chose to place "Potomac" at the center of the record, right before two of the meatiest pieces here (the title track and "Violent Constellations"). "Potomac" is a reprisal of the main musical themes of the record. The lovely piano interlude in the middle of the song would be the perfect cue for a curtain call. For those reasons "Potomac" is a better fit for Paradise Gallows' final minutes, rather than "Where the Earth Meets the Sky", which could function as a mid-album breather amidst the titanic songs that make up the bulk of the LP. A consequence of this unusual sequencing is that Paradise Gallows feels a lot longer than it actually is. "Violent Constellations" is a much needed blast of energy in the record's second half, but even it can't prevent the album from coming to a less resounding close than it could have. "Potomac" makes the title tune and "Violent Constellations" feel like encore numbers, when they most certainly are not that. For all of its innovations and nuances -- and there are many -- Paradise Gallows is a case study for the importance of album sequencing. On the whole, this is an excellent record by one of the most exciting bands in experimental metal. The fact that Paradise Gallows struggles under its own weight, and feels somewhat out of order, does not drag the LP under like a boat being dashed against the rocks of an unforgiving sea. In this way, Paradise Gallows is much like lots of the great long adventures: even if there are points where the path ahead feels long and insurmountable, by the time it's all done there are more than enough rewards to make it all worthwhile.